Harley-Davidson is a hugely successful brand! It is therefore well-placed to lend a helping hand, should it wish. To Buell, for instance - who were given permission to transplant Harley's V-twin engine into their own two-wheeled products. Not that Harley lost out, at all. Erik Buell - founder of the firm - was nothing, if not innovative. Harley were no doubt hoping some of his boundless ingenuity would rub off on their own marque. Erik Buell loved Harley-Davidson! He had been both an engineer and racer for them. He was uniquely positioned, then, to conceive and construct the RR1000 - a Harley-powered race-bike. Success at the track led to a road-going counterpart. 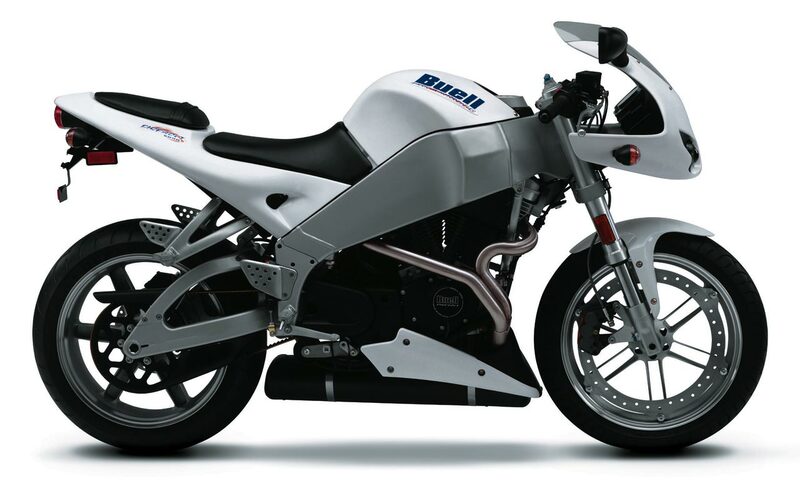 The Buell RS1200 featured a vibration-reducing rubber-mounting system. The bike was also fitted with a radical rear shock set-up. Horizontally slung under the motor, it was both technically, and visually, intriguing. In 1993, the 'big time' beckoned for Buell. Harley took out a 49% shareholding ... subsequently, increased. With Harley-Davidson at the helm, Buell were set fair. Several exciting machines duly followed. Erik Buell's singular vision of how a motorcycle could be built, was always a key component. Amongst those radical two-wheelers was the 'Firebolt XB9R' - released in 2002. Its most conventional part was its tuned 984cc 'Sportster' motor. After that, Buell departed from all things Harleyesque. The Firebolt's frame spars were also its 'fuel tank'! And its swing-arm - likewise forged from aluminium - held the oil! Strange as they might seem, such 'double acts' harked back to motorcycling's classic era. What was indisputably 'new skool' was the Firebolt's front brake disc. Comprised of an ornately-fashioned 'ring', it was tethered to the wheel's rim, rather than hub. Not that the Firebolt was frighteningly fast ... top speed was a manageable 130mph. That was combined with impeccable handling and braking, thanks to the chassis wizardry. Cue plaudits for Erik Buell - clearly, a man at one with his craft. His 'Bolt' came out of the blue ... and shot a surge of creativity into the motorcycle scene.